Beautiful scarf and shawl. I can understand why your knitting slows down as the temperature increases - all that wool is hot on the lap and hands! Ahhh... reading and knitting... if only they were in my plans for the weekend. No doubt you can guess what I'll be doing. All weekend long. Oh my goodness Stacy! Those yarns are amazing!! Love the shawl and scarf, the colors are gorgeous! 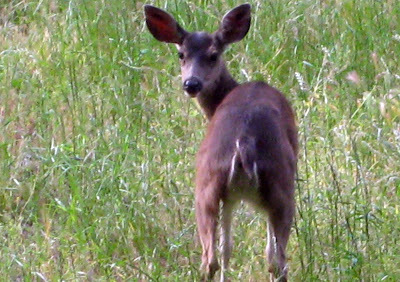 Cute deer and sounds like a great day outdoors! Enjoy your weekend my dear friend! I will be at the ballfield and loving it:) Hugs! Love your reading list! I simply adore the colors of your scarf and shawl. I understand about the curling, however. I don't have the answers for that. Oooh, I love that gorgeous yarn in the scarf you're making! 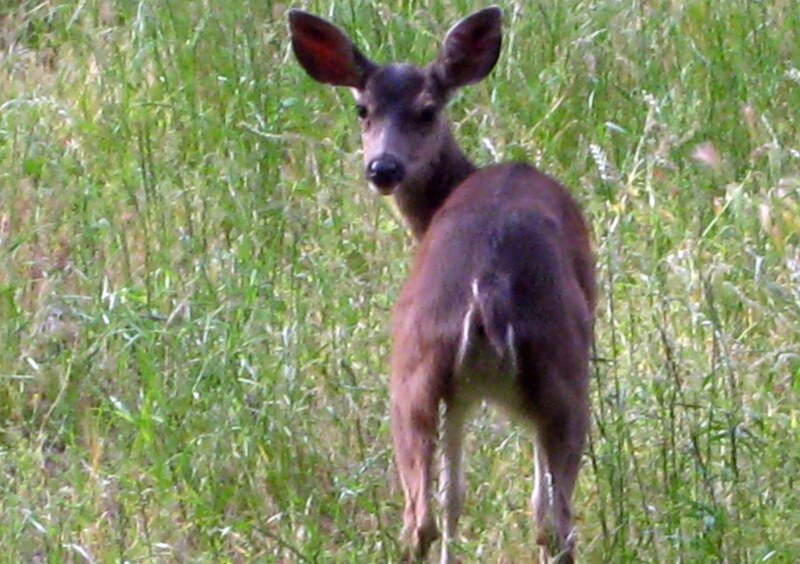 And how lucky to find the little deer -- I love it when stuff like that happens. I'll be trying to make a quick graduation quilt this weekend. I've already had a set-back which will cost me about 3 hours -- I had hoped to pick up a few extra fabrics at lunchtime today, but I forgot to grab the matching fabrics when I left home this morning, so it will have to wait until tomorrow. Grrrr. all that reading. wow. I haven't read like that in a long time. 5 years. LOL! Unless reading "Green Eggs and Ham" over and over again counts. 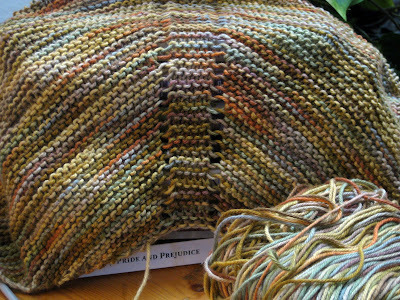 The colors in that yarn you're using in your Apple Tree scarf is GORGEOUS! Beautiful knitting projects. The colors are beautiful. Looks like some fun summer reading. I am back from Hawaii. Had an absolutely fabulous time and Elle was so cute at graduation and her party. Rocky is so, so happy to have us home. He has been following me around and staying really close. So sweet...love our Rocky. Now I know what I'll be reading this summer! Thanks for the info on Pride and Prejudice adaptations. I've just poked around your blog a little bit, but I love all of your photographs of nature. I do so miss the trees in California now that I'm back living in Texas. I am a fair weather friend when it comes to knitting! I only knit in winter, I just get the urge & out comes the needles & off I go. Now, I must also say...the only thing I know how to knit is a scarf & that's because all I can do is knit 1, knit 2 & so on! LOL I have knitted since HS, nut have NEVER gotten any better...isn't that sad? I think when I bring out the needles again in the fall I may try to use your baby bootie pattern & try & make a pair. It's scarey now to even think of it!! All that counting & changing stitches & keeping track of what your doing...I'm sweating just thinking about. You are a Knitting Superstar Friend! 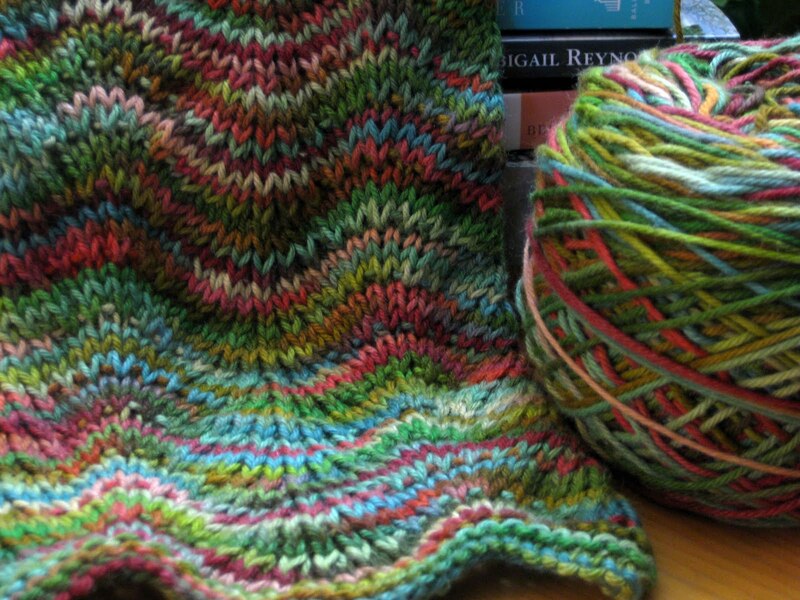 So pretty, those varigated yarns. 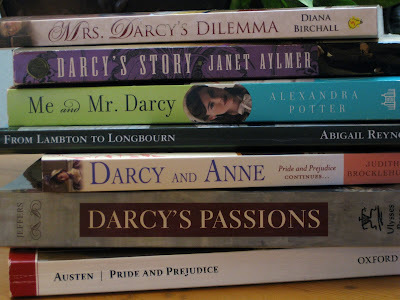 You are immersed in all things Darcy. What fun! Come visit me.. I have a present for you. Your knitting projects are beautiful! Your walk sounded so nice! I love to take walks and be with nature! Thank you, thank you, thank you for blogging about your summer reading! I was going to spend my summer re-reading the Twilight books but upon reading your post I checked out the first two of Carrie Bebris' Mr and Mrs Darcy Mysteries from the library. They are wonderful and so fun to read. You've opened up a whole new genre to me.